5 Bedrooms, 4.5 Baths (Sleeps 16+) Fantastic Views. When completed in 2006, Bear Ridge Lodge was appraised for over 2.5 million dollars. Nestled in the beautiful North Georgia Mountains, the home is located only two miles from the spectacular Amicalola Falls, which is the largest water falls east of the Mississippi and cascades 729’. This 7,000 square foot luxury cabin home located on 25 acres of secluded forests is the ultimate setting for your next family vacation, corporate event or romantic get-away. This home was built in 2006 and is the perfect blend of Rustic Mountain living combined with the latest in luxury comfort. This lodge has everything from a fully stocked lake loaded with Bass and Bream (catch & Release Only), tree house, canoeing, pedal boat, hiking trails, WIFI open broadband Internet, a championship pool table and a 73” HD TV with satellite. Hello! This is Randy Harris. I met my childhood sweetheart Rebecca Alisch when I was in the 11th grade. We married on my birthday in 1973 and also the same day when Becky graduated from Auburn University. We have been married for 46 wonderful years and blessed with 4 terrific children and now 6 fantastic grand. It has been said, “If you count a man’s value in life by his family, then I am a billionaire!” I am living in the closest place to Heaven on Earth that I can imagine. We have 25 acres of mountain land located in North GA with a 3 acre lake looking up at a 700+ waterfall. We are surrounded by National Forest and have a beautiful log home. I also built a 1500 square foot barn with all the “man” toys that a guy could want. My philosophy in life has always been, “To treat the other person like you wanted to be treated.” To always tell the truth and there is right and wrong, good and evil and a Good Lord above us that one day we will answer to!' Becky and I live above the garages and have a private entrance. We are on site to be there if you need us. It's kind of like having a Connoisseur at the front desk at a resort. We have one of the most magnificent views of the mountains and Amicalola Falls. We are located only two miles from the base. This is one of the most beautiful tranquil places on earth. You instantly feel the magic when you arrive. With the abundance of wildlife to watch and the magnificent view of Amicalola Falls it's just a great place to relax and enjoy life. We provide a 'Pirate Treasure Hunt' for the kids that is fabulous. They walk all over the 25 acres solving clues to where the treasure is buried. They love it! The kids can catch fish as fast as they can bait the hook. Catch and Release Only. Pedal boat and canoe are available for your enjoyment. We have 200+, 5 star reviews Come see why! Check us out on Facebook! The view of Amicalola Falls from the house coupled with the Fall Leaves is spectacular! The Appalachian Trail starts just 2 miles from our home! We provide a 'Pirate Treasure Hunt' for the kids that is fabulous. They walk all over the 25 acres solving clues to where the treasure is buried. They love it! There is a 7 person Hot Tub conveniently located on the deck outside the Master Bedroom for your enjoyment. The kids can catch fish as fast as they can bait the hook. Catch and Release Only. Bear Ridge Lodge is the perfect location for small Weddings(40 or less), Family Reunions, Corporate Retreats and Great Getaways! Bear Ridge Lodge is happy to have Paige Sweany with Sole Photography on board to capture all those important moments happening during your stay. With 10 years’ experience under her belt, we feel confident that she can give you both the Customer Service as well as the products that you deserve. Paige is qualified in many different aspects of Photography, as a Freelance Sports Photographer with the local Newspaper matched with her expertise on weddings; we feel that she would be the perfect woman for the job. So whether you are looking for an hour session to capture those long overdue Family Pictures or it’s your special day, let us know! Check us out on Facebook! 3 Heating and Air Conditioning systems keep you in total comfort. Two large heating and air conditioning systems heat and cool the Lodge. All beds have bed mite protection. Wireless Internet is located throughout the Lodge. Large fluffy towels are provided. The large cozy living room with the 53 inch fireplace makes those winter nights a wonderful gathering spot. Large Jenn Aire stove/oven and grill for all your cooking needs. Just added a Belgium Waffle Maker. Large microwave with all the latest features is conveniently located in the huge kitchen. Complete supply of all your cooking needs. The kitchen is fully equipped with everything you will need to prepare meals for your visit. Amicalola Falls Lodge, located only two miles away has a restaurant! Windstream provides Dish with hundreds of channels to choose from. Many books are available for your reading pleasure. The hammock on the deck is a favorite place to read. Nintendo and other video games. The 'Pirate Treasure Hunt' is a huge hit with the kids that takes them all over the property as they solve clues to find the buried treasure. It can be as long and as difficult as you would like. Championship pool table is located on the second floor for those family get togethers. With 25 acres, there are many trails to enjoy all the local wildlife. A large canoe is available for you to enjoy. A fantastic deck is located all the main area with an unbelievable view of Amicalola Falls. Decks all across the front of the Lodge facing the Falls. Several golf courses are located near the Lodge. There is a 4 person Infrared Sauna located in the Mater Bathroom. There is a 7 person Hot Tub conveniently located on the deck outside the Master Bedroom for your enjoyment. We drain and clean the hot tub and the filters between every rental! Outdoor Fire ring to make those marshmallow and smores. We will start and provide the wood for your enjoyment. There is a 7 person Hot Tub conveniently located on the deck outside the Master Bedroom for your enjoyment. 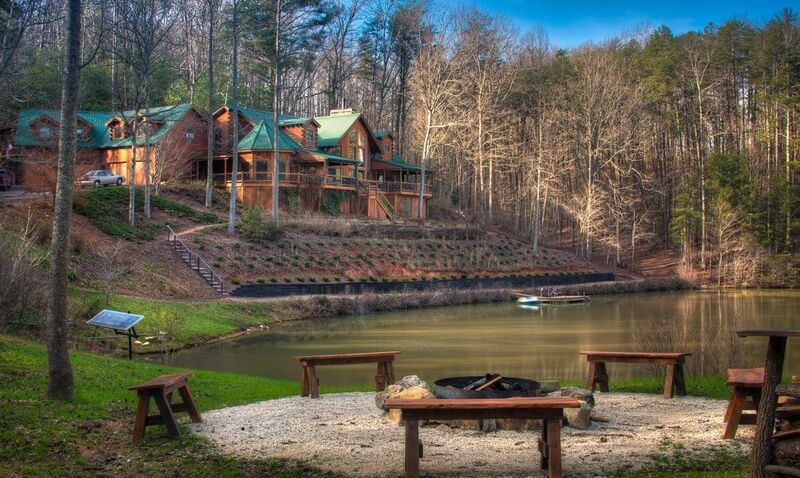 Bear Ridge Lodge is perfect for weddings, Reunions, Corporate Retreats, and family gatherings. We provide a 'Pirate Treasure Hunt' for the kids that is fabulous. They walk all over the 25 acres solving clues to where the treasure is buried. They love it! Our stay was perfect, from the moment we arrived we were greeted by Randy and his wife Becky. They were both great and welcoming. They kept the crowd laughing all weekend and only made an appearance as requested. The property itself was immensely beautiful and breathtaking. We had approximately 20 guests and everyone had somewhere to sleep and not once did we feel as though it was crowded. The home has a spectacular layout, built for entertaining guests and large parties. Everything was perfect, we couldnt have asked for a better way to spend some tine with our friends before our wedding! Will definitely keep in this place in the books to go back. We loved hosting your wonderful family and friends. We are looking forward to your return! Thanks for that great review. What a wonderful group of Christian men. We look forward to your return. Thank you for that wonderful review! We certainly enjoyed hosting your company retreat! You have an awesome team of professionals that work with you! Keep up the good work and we look forward to your return! Great family vacation with great host! Thanks for that great review! We look forward to your return. Becky and I throughly enjoyed your stay and hope you will plan your return visit! We too enjoyed your stay! Y’all are most welcome to back anytime! When completed in 2007, Bear Ridge Lodge was appraised for 2.5 million dollars. Nestled in the beautiful North Georgia Mountains, the home is located only two miles from the spectacular Amicalola Falls, which is the largest water falls east of the Mississippi and cascades 729’. This 6,000 square foot luxury cabin home located on 25 acres of secluded forests is the ultimate setting for your next family vacation, corporate event or romantic get-away. This home was built in 2006 and is the perfect blend of Rustic Mountain living combined with the latest in luxury comfort. This lodge has everything from a fully stocked lake loaded with Bass and Bream (catch & Release Only), tree house, canoeing, fire ring, hiking trails, WIFI open broadband Internet, a championship pool table and a 73” HD TV with satellite. There is a 7 person Hot Tub located on the deck outside the Master Bedroom for your enjoyment. The lodge has 5 spacious bedrooms with 4 1/2 baths. The master bedroom has a spa shower with 6 massaging shower heads and also the Lodge has an infrared sauna with room for four. In all there are 4 King size beds, 3 trundles, 1 queen sofa bed and 2 inflatables. The lodge also has a portable 'pack and play crib available for use. To make your stay even more special, there are covered decks that wrap around the front of the home with fantastic views of the falls and an outdoor fire ring to enjoy those wonderful nights. While this amazing home gives you all of the seclusion you could ever want, it is conveniently located just 10 minutes from the Lodge at Amicalola Falls, which has a restaurant. For the serious shopper, the North Georgia Premium Outlets are just 20 minutes away!! You are also only minutes away from some of the North Georgia Mountains premier apple houses and fun-filled pumpkin patches. You are just 90 miles north of Atlanta and 70 miles south of Chattanooga.